Aqua (water), Aloe Barbadensis Leave Juice * (Decolorized), Glycerin, Persea Gratissima (Organic Avocado) oil, Behentromonium Methosulfate, Cetyl Alcohol, Caprylic/Capric Triglycerides, Cetyl Esters, Cetearyl Alcohol, Phenoxyethanol, Butyrospermum Parkii (Shea) Butter, Polyquaternium-7, Fragrance (Parfum), Hydroxpropyltrimonium Honey, Panthenol, Oryza Sativa (Rice) Bran Oil, Simmondsia Chinensis *(Organic Jojoba) Seed Oil, Hydroloyzed Wheat Protein, *Achiellea Millefolium(Yarrow) Extract, *Urtica Dioica(Nettle) Leaf Extract, *Salvia Officinalis (Sage) Extract, *Equisetum Arvense (Horsetail) Extract, *Lavandula Angustifolia( Lavendar) Flower/Leaf/Stem Extract, Benzoic Acid, Ethylhexylglycerine, Glyereth-2 Cocoate. After using my Mielle Organics Detangling Co Wash and Mielle Organics White Peony Leave In Conditioner , I use this Moisturizer for extra moisture and to style while my hair is wet. When my hair is stretch and dry, I would re-moisturize with this product along my hair, especially on the ends. This product has a light and fresh scent, like the Mielle Organics White Peony Leave In Conditioner. This definitely lets me know that the two product belong together and won't 'out-scent' the other. This scent stays in your hair for a few days. This complements the light leave-in as being a heavier product to ensure moisture for the next few days. Even using the product on the ends keeps them moisturized as well! This is not too heavy where I cannot use during the week. This product does not cause heavy product buildup. 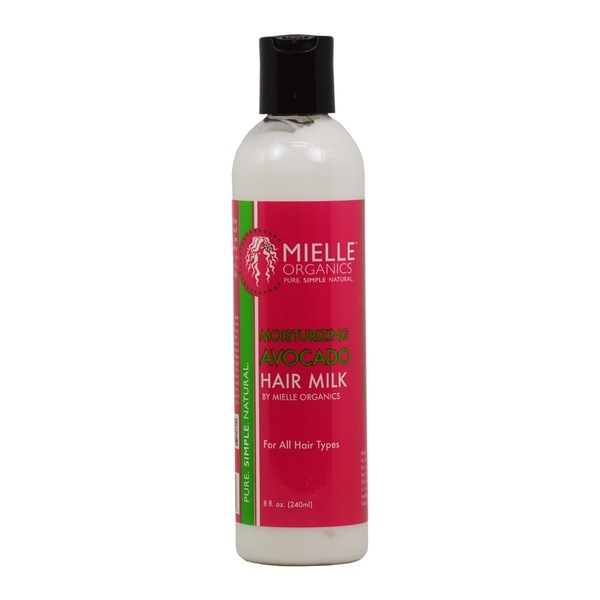 Have you tried the Mielle Organics Moisturizing Avocado Hair Milk? What did you think about it? *This is a product review for Mielle Organics Moisturizing Avocado Hair Milk, which was purchased with my own money and is my honest opinion.